Greenhouse Seeds harnessed Neville's Haze, Cambodian and Laos to create Arjan's Ultra Haze 1 and the result is nothing short of being a "Guru" of cannabis. The high induced by this strain is intended for those seeking mental meditation, introspection, reflection and contemplation or simply put spiritual relaxation. All those exercises of the brain are a great way to achieve patience and that is what you will need if you want to savor her, for she requires 13-14 weeks to reach full maturity. 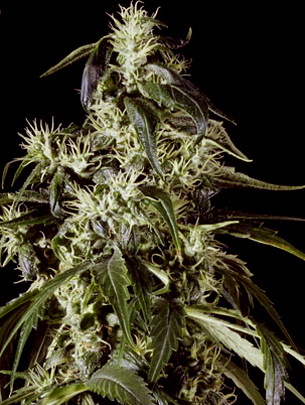 Arjan's Ultra Haze 1 is a tall plant with long branches and high yields. This is a great variety for LST (Low Stress Training) and if you treat her right, your patience will be rewarded. Outdoors it is possible to achieve results in excess of 1kg, but she requires a warm climate and won't be ready for harvesting before early November. The large rocket-shaped flower clusters wear a hairdo of a few orange and an abundance of nearly white pistils, as if the plant would want to indicate the wisdom of a white-haired elderly person.